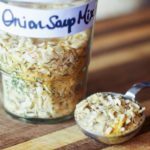 Homemade dry onion soup mix recipe made with only eight ingredients that you probably already have in your kitchen! 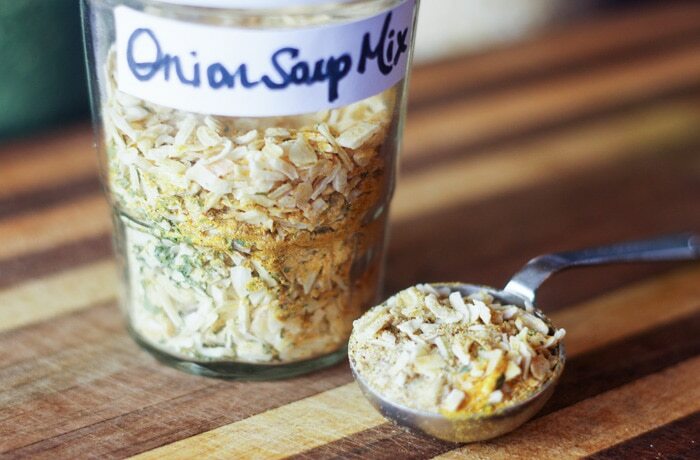 Making your own seasoning mix like onion soup mix makes so much sense. It’s almost silly. Many of us who have found ourselves grabbing a packet of pre-made mix at the store will chalk it up to convenience. But honestly, isn’t it more convenient to have a homemade mix in our cupboard at all times? When our family has a hankering for tacos, mom’s meatloaf or venison steak, I don’t have to think twice about seasoning. Homemade mixes are also less expensive because you don’t have to pay for individual packaging or market price. I buy spices in bulk about once a year and from that, I can make dozens of seasoning mixes, label and store them. Today, I’m going to show you a very simple recipe for homemade onion soup mix. Are you with me? Ok. 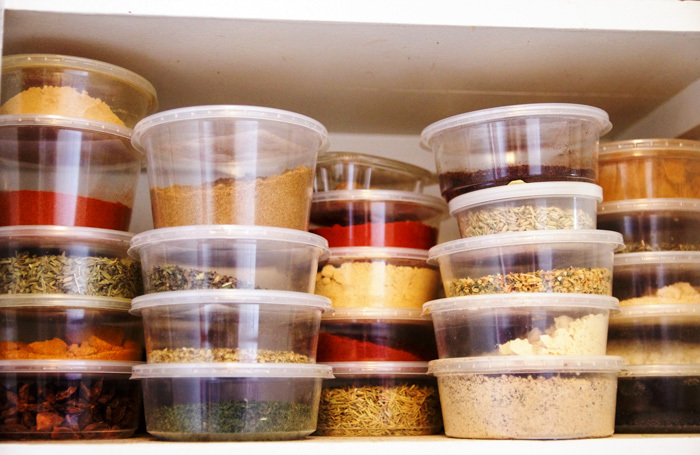 So here is a snapshot of my bulk spice cupboard….and this isn’t even all of them! ha! Bulk spices are really the way to go. 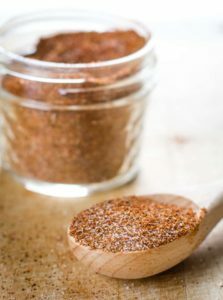 I can get bulk cumin spice at a price of $6 per pound! That’s enough cumin for tacos, hummus or chili for an entire year. Of course, you can select smaller sizes if you’d like. Bulk spices are available online, throughout Amish country or at grocery warehouses like Costco or Sam’s Club. 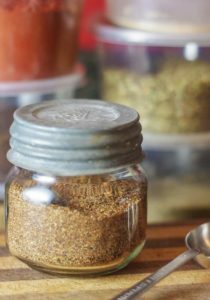 Once you have your spices on hand, you can start making your seasoning mixes! For onion soup mix the following 8 simple ingredients. 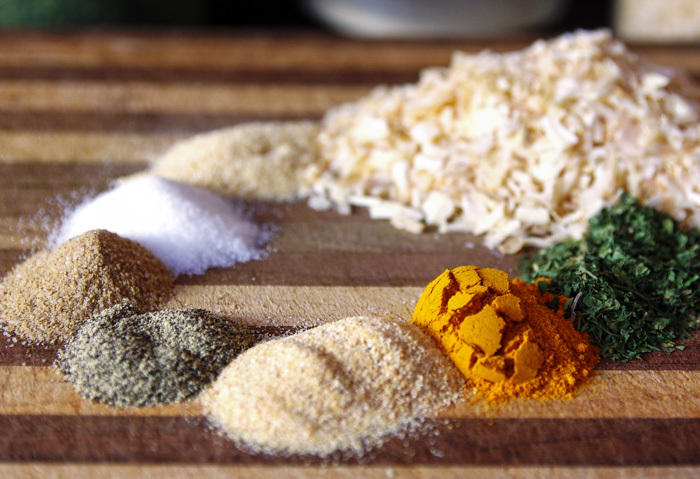 If you prefer a more conventional mix, you can leave out the tumeric. 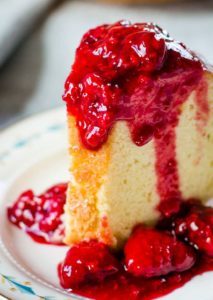 If you like your mix on the sweeter side, you can add sugar. The beauty of a homemade seasoning mix is in the homemade! I like to store my seasoning mixes in vintage jelly glass jars like this one because they don’t have designs on the glass and the labels will adhere easily. Seal your mix with an airtight lid and store it in a cool, dry place. When ready to use, shake it up a little and use it. How Much Onion Soup Mix Is In A Packet? Each Lipton Dry Onion Soup packet has about four tablespoons. So if you’re substituting for the packets then you’ll know how much of your homemade onion soup mix to add. Here’s what I use in some of my favorite recipes. Every six months or so, I check the status of my mixes and freshen them up if needed. The options for a homemade mix are endless! They are also convenient, less expensive and lack all mystery. Enjoy! 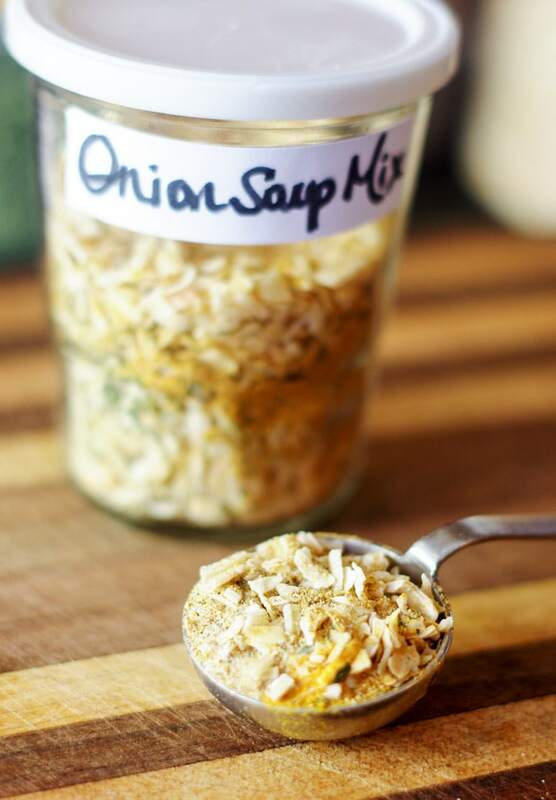 DIY homemade onion soup mix made from 8 ingredients that you have in your cabinets already! Perfect for meatloaf, chicken and other recipes. Combine all the ingredients and store in an air tight container. I was out of minced onion, so I did a scant doubling of the onion powder and it still gave a great flavor to my venison. Haven’t been to the store yet, so trying this method again today, but adding a tiny pinch of cayenne. I’ve sprinkled it all onto the frozen chicken in my crock-pot with a little water and expect it to be delish!! We have allergies in the family that rule out packaged onion soup mix, so this is a real game changer! Thank you! I so agree, I love making my own spice mixes, but have never tried an onion soup mix. My mom always used onion soup mix to flavor hamburgers when I was a kid, but I’ve shied away from it because I hate buying the packets. Can’t wait to give it a go but with my own blend! This is a great idea! 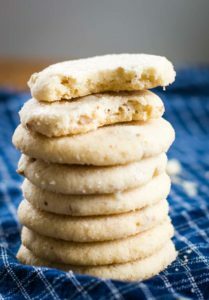 My mom used to used onion soup for a few things when I was a kid, and I love this healthier option. I love DIY mixes whether I’m giving them away or keeping them all for myself. We particularly like onion soup mixes, so this is going to be a life saver! Great idea Claire to give them away! I’ve actually never thought of that!